Enchanted Parks has a Trailer! NewcastleGateshead Initiative and Gateshead Council’s popular after-dark arts adventure in the atmospheric setting of Saltwell Park is making a welcome return this festive season. 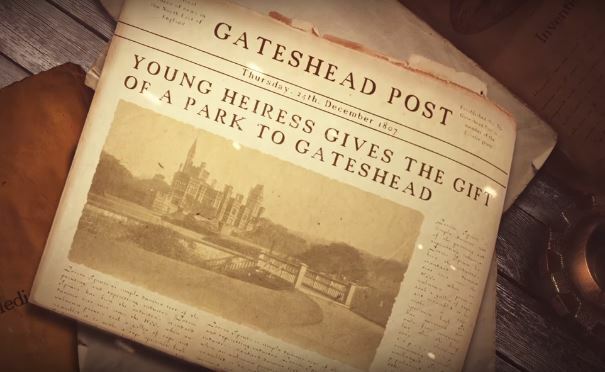 This year’s event tells the enchanting story of Ursula Wailes, the eldest daughter of William Wailes and heiress to the Saltwell Towers Estate, who makes a gift of Saltwell Park to the people of Gateshead. After filling the park with incredible inventions, plants from all over the world and wonderful creatures, she captures the imagination of children and adults alike; many reporting that the park itself feels ‘alive’. Like our Facebook page facebook.com/NGWinterFestival or follow @WinterFestNG on Twitter.